Why Diving Siaes Corner Should Be on Your Bucket List? Siaes Corner is not the most visited site in Palau, making for an excellent site to dive without crowds. Most divers head off to the north where they are amongst dozens of sites to choose from. But if you pick the right day to cross the seas then heading west out to Ulong Island can prove to be a day of diving heaven. If you’re a novice to intermediate diver and are wanting to try out a strong drift dive for the first time then try out Siaes Corner. On the plateau at Siaes Corner, if the current is strong, divers can try out their reef hooks and hook onto the top of the plateau. Doing so will give you confidence in their hooking in skills while watching all the action along the top of the reef. 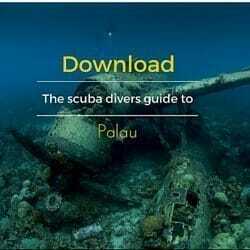 The best depth to witness the most activity is between 30 to 60 feet, so this dive is often paired with other dives out at Ulong Island area as the last dive of the day. Meanwhile, depending on the direction of the current, Siaes Corner can be dropped in on from either direction. Siaes Corner is where the sharks hang out..
During an incoming tide large schools of Jacks, barracuda and Grey Reef Sharks can be seen along the edge of the reef amidst the Pyramid Butterflyfish, Square Anthias, Moorish Idols and Yellowtail Fusilers. Keep an eye out for the large Hawksbill and Green Turtles along the reef. They can, usually, be spotted munching on the corals along the reefs’ edge. Siaes Corner is the ideal spot to get up close and personal and snap the close up shot of these beautiful creatures for they seem to be too enamored with the corals to even notice divers alongside them as they munch to their hearts’ content. There are a handful of excellent dive sites along this western reef system, properly named Rebbotel Reef. Pair Siaes Corner with Ulong Channel or Siaes Tunnel and add on top of that a stop for lunch and a snorkel at palm-laden Ulong Island and you have a diver’s day in paradise.